When creating a tactic you need to have an idea of how you want it to play and have an idea of the kind of football you want to see. Without knowing this you’ll feel a bit lost and struggle to have success. Everyone needs a starting point of some kind whether its an idea, tactical philosophy or a style of play. Having this thought out will make it possible to build around this and give you a starting point. This thread will hopefully show you how I create a tactic and give a few of you a couple of ideas along the way, especially if you feel a bit lost for direction and not quite sure where to start. 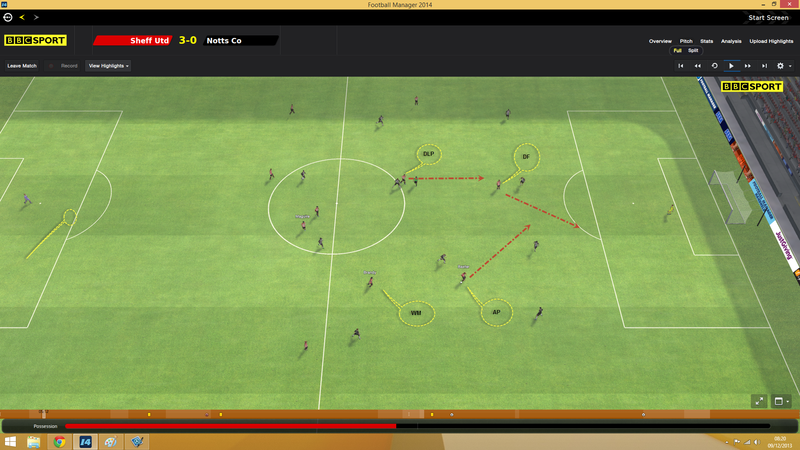 While I am copying Bayerns style of play to some degree I have to adapt it to suit the players at my disposal. I actually don’t have the right type of players to play this way but that’s a good thing for this thread as it will mean there are more discussion points and it should be a lot harder for me to get right. Over time as the squad gets stronger and I bring the right sort of players in that fit this system then the more like Bayern it should become. But this will take time and not something you can do off the bat and copy instantly unless you are lucky enough to have a squad with the players already in it. 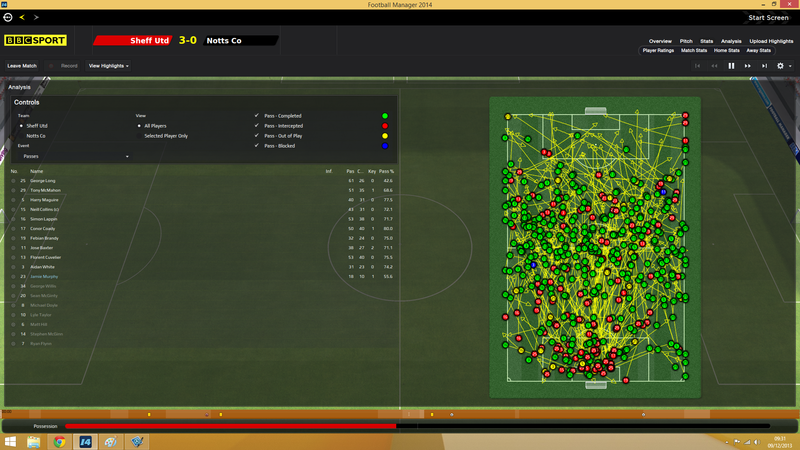 Once you have some kind of inspirations its all about setting this up in Football Manager. So what I do is create some kind of base tactic for how I try to translate the information I found in the articles above into the game. I call it a base because things never work exactly how you think and you have to make changes during games or to your initial setup should you find something isn’t working. The striker is better suited to being a defensive forward. Some could argue they are a false 9 or even a deep lying forward. However due to the nature they press the defence then a defensive forward is more logical. Well actually it isn’t because we don’t know if the ideas or logic behind what I’m trying to create even works. The next part of this thread should explain more about getting it to work in games. It’s important that for the first game I try and leave stuff untouched the best I can so I can get a real feel of how stuff is working and what’s going on. I’ll still make the odd changes in game if I feel I’m losing the game. But for most parts I like to let the game play out without changes if possible so I can view it back after. Watching a game after its happened is easier than watching one that’s in play because sometimes you view it differently because the result doesn’t matter as the game is over. The opening game of the season I managed to win 3-0 which isn’t bad and most people might be happy with that. I’m not though because I don’t yet know why it was won, it could have been down to opposition errors, a bit of luck on my part. I like to understand why I win/lose/draw games because then you fully understand the ins and outs about the system you use. 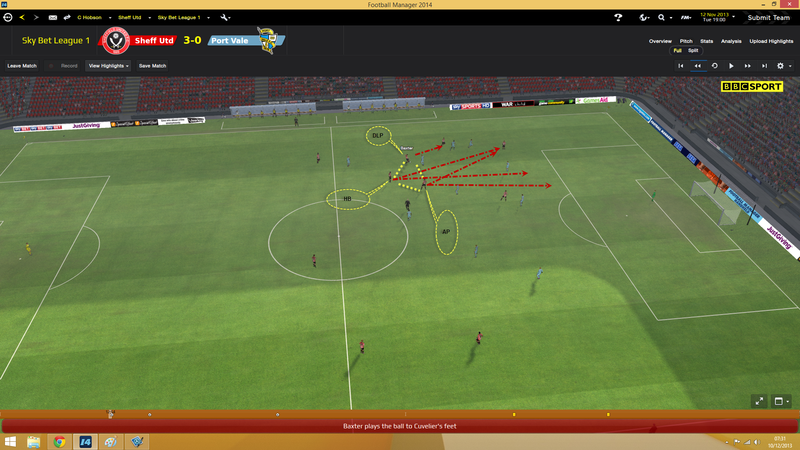 It’s the manner in which my side play which I am most concerned about throughout my managerial careers on FM. I can accept defeats if I know its not down to me neglecting the visual side of the game. These stats give a very quick and brief overview as to what happened in the game but without knowing the individual stats of the players then these match stats can be very misleading. The first thing I want to focus on though is not the stats this can come later. What I’ll do first is watch the first 5 minutes of the game in real time so I can see the positions of my players in both defensive and attacking phases of play. This screenshot is straight from the kick off and tells me a lot already. 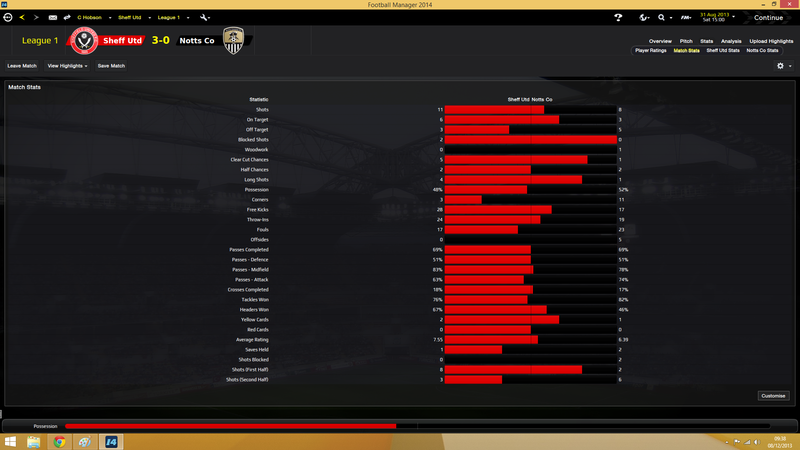 On the left side it shows that the wide midfielder is looking to get forward and taking up a good position. The striker is dropping deep to find space and considering Notts County are playing a 4-4-2 this is ideal because he’ll be unmarked. On the right side though the wide midfielder is deep and the right back is very close to him. he could be going past him looking for the overlap though so this is something I need to keep an eye out for during the game to make sure its not an issue. Both the central midfielders are unmarked which is good and should allow them to find space and pick passes out. The half back has dropped into the back line to make it a flat 3 which is good due to how wide I seem to be playing. The space between both centre backs would be too big otherwise. So already 10 seconds into the match it has given me a lot to look at and consider while watching the game. In that move you can see my half back, advanced playmaker, deep lying playmaker, striker and left winger all combining and showing some encouraging signs. Especially the amount of space the central midfielders seem to have. They tend to be unmarked when watching this back which should allow them to dictate the game more. So the above clip highlights the advantage of playing wide and using the space well but this can also be a downside when hit with a quick counter attack when you lose possession or a simple long back which is quickly taken. The next screenshot will highlight the issue I’m talking about. The defenders are naturally pushed wider do the role of the half back so this means if he doesn’t drop back far enough then the gap between both centre backs is a MAJOR issue and cause for concern. As you’ll see in the screenshot if Campbell-Ryce wins the header he has a few options which can se seen with the blue dotted lines. Each one of these options could cause potential issues should I not win the header. Luckily I did win the header and the right sided central defender actually dropped back and picked up the wandering striker. There are a few points that I need to make you aware of at this stage. Remember my team instructions of pushing the defensive line even higher? Well the above screenshot highlights this too and shows just how risky it can be and how easy it is to exploit it if one of your players misses the header, tackle, challenge or just under performs on the day. It comes down to reward versus risk so you need to fully understand the implications of using risky team instructions and the issues you can be faced with. 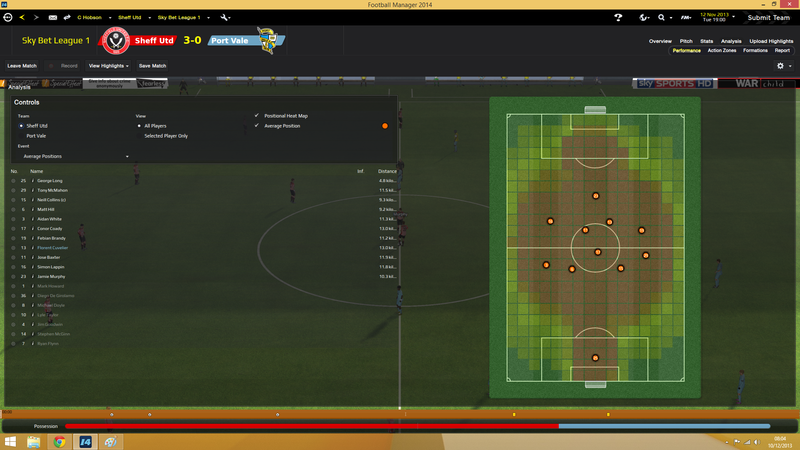 Next up I can see the effects of having a wide midfielder on a support duty and with the cuts inside instruction. He receives the ball then moves central while the advanced playmaker pushed forward. This is exactly the reason I wanted the widemielder to cut inside for, allowing him to link up with the advanced playmaker. 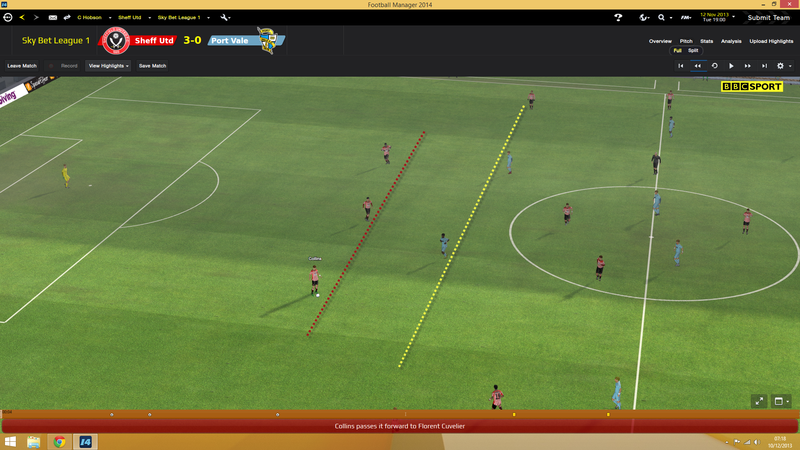 This does mean that if the right sided wingback doesn’t push on then I lack width. This isn’t an issue here because he’s covering the oppositions left wide player. But later in the game or in tough games were sided are hard to break down then the lack of width might be a real issue because I’ll have no-one stretching the opposition. For this move though its okay because the advanced playmaker can feed a simple ball between the two centre backs and my striker is through on goal. My deep lying playmaker is also pushing up to support. You’ll often see me mentioning in various threads that your tactic needs to have good movement between the lines and if you use a lone striker then he needs support from the midfield. I think the above shows this well and you can see the striker, deep lying playmaker and advanced playmaker have all made runs and are now in space when the move continues. The striker created his space by dropping deep, the advanced playmaker creates his space by pushing up and the deep lying playmaker has gone around his marker. Murphy who is my striker gets the ball from Baxter when its played into the path he’s running in and the keeper does a good save. The defender at the top of the screen looks like he’s actually lost the opposition's players which is a worry. I’ve not watched the whole clip yet but this is what I’ll be looking out for during this move. The rest of the players positions seem good enough and there is no real threat it seems. 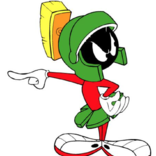 I’m covering space well. The only real option the opposition have is to play the ball forward so their striker can run onto it. The move actually comes to nothing and my players are actually running back to provide cover. The opposition doesn’t really have any options but to shoot or look to pass it backwards. I’m confident my side can deal with any kind of cross because the opposition doesn’t have anyone to really aim for. 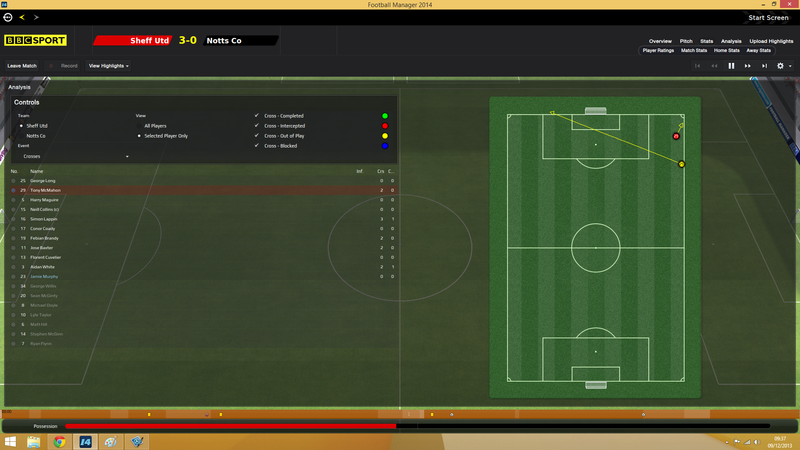 The third goal I scored came from a goalkeeping error. So while I won the game 3-0 onegoal was an error and one was an own goal. So in this sense the 3-0 win seem flattering. Defenders too wide at times when the half back is caught in two minds or was caught out of position. I might be pushing up too high at times but it wasn’t an issue in this game. However against a quickly team or a side who counterattack this might a risk. The width on the left is fine because the wide midfielder on that side pushes a lot higher up than the one on the right side. But against more narrow teams or teams who park the bus I’ll need him to be more adventurous or I’ll have no width down the right. Those are the only real issues I had from watching the game and I was pleased with how things seemed to work together. You also have to remember these issues might not occur against other formations and might be specific to playing against a 4-4-2. This is one of the reasons I always use a base tactic and work from that and any changes I make are due to what is happening in a game. You are being naive if you think your formation works the same against every single opposition. I believe this to be one of the reasons we see people post along the lines of ‘I won 3-0 to Man Utd away but lost 2-1 at home to Coventry’. It’s because people don’t really understand that each team will play different even if the shape is the same and if you don’t make minor changes you can be punished heavily. Watching the game allows for you to see what happened or what is happening but this isn’t the only vital tool we have for checking things. After many years of studying the game and the analysis tab I’m confident I can spot issues by using this great weapon. Let me show you how I use it. By looking at this part of the analysis tab it allows me to see which players are taking shots and if I click the little dots I can view the shots back. This allows you to see exactly why a shot was missed or why certain players are taking shots. It shows you the full clip and a bit of build up to the move so you get all the info you need when watching the clip back. In this game I was actually happy with the shots but was concerned by 2 shots from my right wingback. I was only concerned because he isn’t the one I want shooting as he should always have a better option nine times out of ten. But when I viewed them back they were both free kicks so that isn’t an actual issue. The first issue I notice here is my goalkeeper and the amount of times he gave the ball away. So instantly I know for the next game I’ll specify that he must distribute the ball to the defenders in the hope we can retain the ball naturally and not give it away for no reason at all. 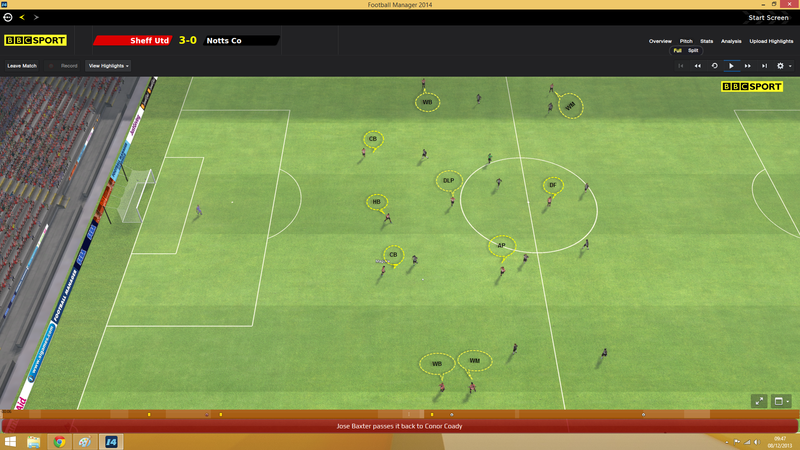 My players have quite a poor passing attribute and decision making, so I expect them to give the ball away. What I decided to do here was view some of the intercepted passes back and see why they were intercepted. I notice that for my right wing back he aimed for the striker quite a few times and got nowhere near him because my striker isn’t an aerial threat at all. So again for the next game I’ll look at tweaking his instructions somehow to see if I can cut that out. It’ll still happen to some extent but I can reduce it happening. Not sure how yet but it’s something I’ll update next time I play a game. The way I’m set up and the way I play crosses aren’t really something we focus on. So I can ignore this tab but I’ll still keep checking it just to make sure someone isn’t having excessive amount of crosses as this would pinpoint a flaw in my set up.Crosses happen even if you don’t set up to use them that’s football, especially when a winger or fullback might see a quick opening and attempts the cross. Everyone should be able to see the issue here? After viewing all the headers back that Murphy missed the issue is crystal clear here and actually ties in with George Long’s poor passing ratio. He’s trying to find Murphy all the time when he has the ball. Hopefully this will be fixed when I instruct him to distribute the ball to the defenders instead. I’m really pleased with these stats but I’ll still see why Lappin missed 50% of his. After viewing the clips back off the missed ones it's quite clear that he is over reaching for the tackle at times. This could be due to me using the hassle opponents shout and is something I’ll look to correct for this player only in the next game. I’ll give him individual instructions to close down less in the hope it stops him over reaching for the tackle. This screen doesn’t tell me anything I didn’t know already. But it can still be good for you to check them out if you feel you are giving away a lot of fouls. It can help you see why and ties in with tackling above sometimes too. If you want to see the kind of areas you are intercepting the ball then this is a great tool for seeing that. It can help you determine if you need midfielders to help out more defensively etc. The players in my tactic who you’d assume would win interceptions did exactly that. This is probably the most important part of the analysis tab for me because it allows me to view all the good chances back and I see why they are missed. By viewing the clips I can see some of them were good saves by the keeper. This doesn’t bother me though as it happens. What would bother me here though would be no scoring chances or poor quality chances (half chances). The more green dots the happier I am and I felt I had good chances in this game. I was actually unlucky not to score a few of them or the score could have been four or five nil. I actually don’t pay too much attention to this part. I have a quick glance but it doesn’t really tell you much about how the game went or how it was won/lost. It does show the issue I mentioned about the centre backs though splitting too wide. This is the downside of using a half back and there is a bug where the defenders stay too wide on the split and hopefully will be fixed at some stage. You can see who is making the runs/dribbles here on this screen. Having these runs help but if you play a passing game of any kind then these can be quite low at times due to focusing on possession. I’m happy with the amount of dribbles we did in this game so nothing for me to learn here. This is basically it for the first game. Hopefully it will give you an idea of the effort I put into creating a tactic and the stuff I look out for during and after games. I will actually add some more stuff to this but it won’t be until after Christmas. That’s what I plan on doing and I might expand it even more depending on time. Sometimes a very minor change can make all the difference to a game and I just came across one of these moments so thought I’d write a little about what went down. During the first half I thought I played okay and when I looked at the stats I saw nothing out of the ordinary. But viewing sections of the match I could see my midfield wasn’t linking with the striker to well due to them been more focused on marking the opposition midfield. What do you see in the above screenshot? When I was looking at clips of the game so far this was a common occurrence and something I saw an awful lot of. You can see I’m quite deep and being pushed back by Preston. The striker is isolated and when the ball goes forward he has no real support. If you look inside Preston’s half then you can see there is a lot of space to be exploited and currently I’m not making them defend. With this in mind I made 2 very important changes at half time. I made the advanced playmaker become a central midfielder attack and the deep lying playmaker became the advanced playmaker support. Now you might be thinking why did I switch the roles and not make the deep lying playmaker the central midfielder attack, well this is very simple - If you look at the settings I use then you’ll notice the left MC is the DLP and next to him is an attacking wide midfielder. I wanted to keep balance in the midfield and have the attacking midfielder supported by having a less attacking option next to him, hence why he’s on the right next to the support wide midfielder. 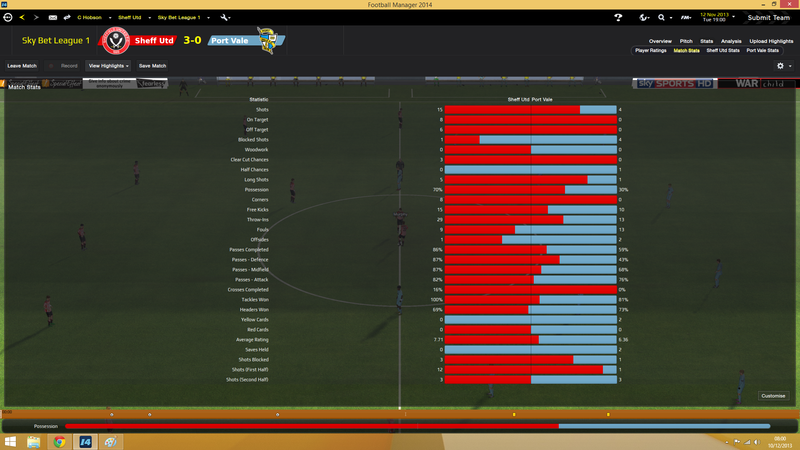 The start of second half you could tell the changes I made had made a massive difference. Six minutes into the second half the central midfielder on an attack duty won a freekick after being brought down and I scored from it. As you can see he was moving around more and causing Preston all sorts of defensive issues. There are quite a few options I could use when facing stubborn sides who sit deep and are hard to break down. I could be relentless and do attack after attack in the hope that sooner or later I force them into a mistake and that they buckle under the constant pressure. This approach tends to have more shots but less accuracy because the higher you play and the more aggressive you are then the more cramped the final third becomes. Another option would be to try and force them up the pitch more by going counter attacking and hope they had to push on more. You’d be surprised how many times this can actually work due to the opposition becoming more adventurous. The down side is they will still probably be solid at the back and set up well, normally narrow too. So it can still be tricky. Port Vale lined up with a bog standard 4-4-2 so I knew I’d find space behind their midfield and with the half back I had the numbers advantage in the middle. So what I decided to do was switch from the attacking strategy to a control one so I wasn’t positioned too high and removed the push higher and faster tempo shouts so I could actually play at a slower pace. This meant that I’d be deeper than normal which in turn gives me more space to work with. Space and movement is the key for beating any side who sits deep and is happy to defend against you. For a bit of extra security I also used the retain possession shout and the exploit the middle one too. This was so I could impose myself on the game from a central position and force Port Vale’s midfield duo to mark my players which shouldn’t be an issue because the half back should be more like a central midfielder in this game so I’d always have a free man in the centre. This automatically creates space without me doing anything because Vale’s midfield either drop off and sit deep to protect their defence and stop runners from my midfield. Which would mean my central duo would be more like AMC’s and would be in great positions to feed the wide men the ball, especially on my right side were the wide midfield cuts inside and supports, this would create an overlap on the inside. Or they push up and try and hassle my midfield pairing which creates space behind them for the free midfielder or wide midfielder to run into. It could go either way and I’ll have to see how it goes during the game itself. You can see once the game starts how deep I am compared to normal. The yellow line is roughly where we normally take up position. You can see already that my two central midfielders have space which means they can dictate the game and hopefully influence it more. This screenshot shows Port Vale have 8 men back in this move. It also highlights my central three and the triangle they create giving whichever one of them on the ball a passing option. It might look like I don’t have any options but I actually do because any kind of long/direct/through ball now would split Port Vale open and put them on the back foot. It would be hard to defend against too because it would catch them out and make the defenders flat footed because they are still atm and 2 of my players are actually in movement. So I’d say this gives me the advantage and edge if the ball does reach one of the highlighted options. That’s the deep lying playmaker, advanced playmaker and the half back all combining and doing exactly what I wanted them to do. I actually think this goal highlights how important it was for the player to have space to run into and make movement from deep. If I was more attack minded for this game then the space he ran into before the pass for the striker would have been congested and wouldn’t have existed. Do you see why I always bang on about space and movement? 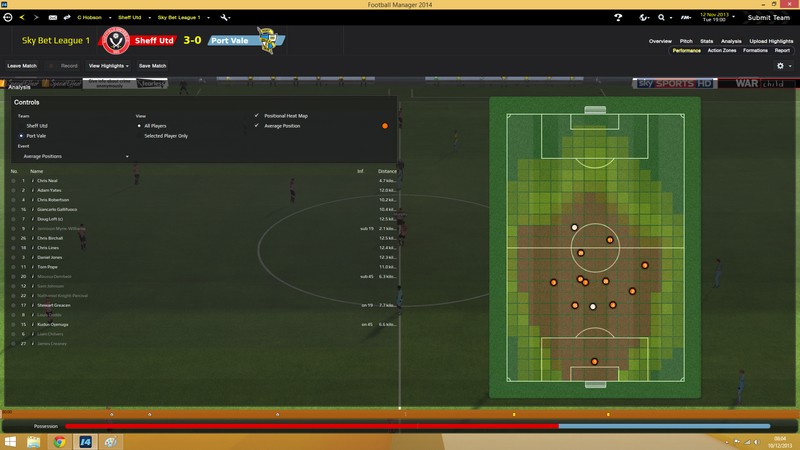 It’s so vital and important for winning games that the strikers have support, especially if you use a lone striker. 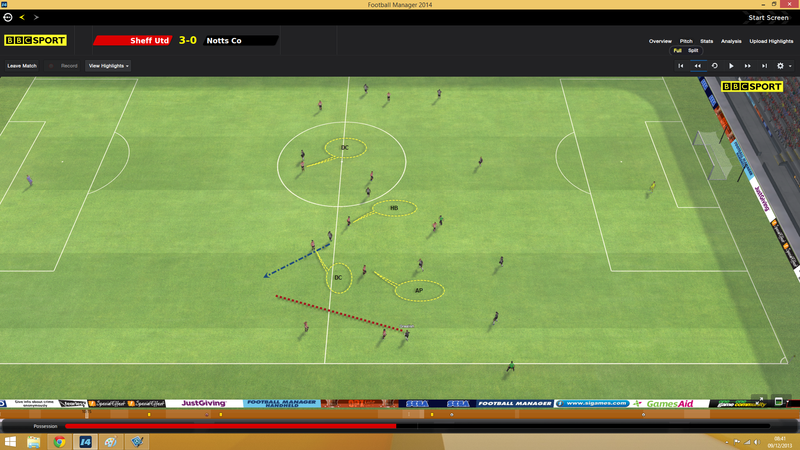 Its a quick counter attacking move but it exposed their MC’s when they pushed on too far. It just allows me to dictate through the centre. 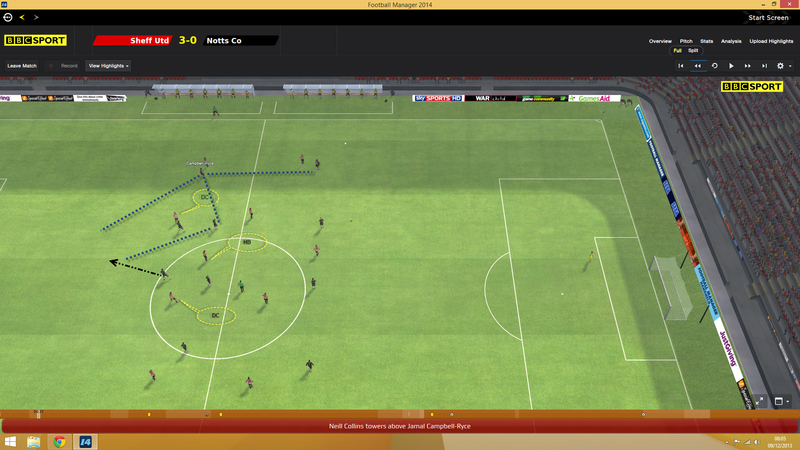 The third goal I scored came from a corner. I’m not set up to create lots of chances but instead the tactic relies on creating quality good chances. You’ll get more of an idea when I post more about this at a later date. The game played out as you’d expect, I had lots of possession, a few good chances and restricted them to just blocked shots. I know some of you might be disappointed by this post and was expecting more maybe, but this is all the changes I did. I believe I play the game in a very simplistic way and don’t make drastic changes. My threads always seem more detailed than the way I actually play the game because I’m trying to translate how I play across. But I play at a very high speed and I truly believe that less is more when it comes to minor tweaks based on what is happening on the pitch. Just noticed I've uploaded 2 screenshots wrong as they only show the fullbacks stats, I'll fix it when I get the change later in the week. That's all I'll be doing for now but thought I'd still release what I've done even though not finished so people maybe think a bit different or atleast get some ideas for a starting point. I believe this will help a lot of people. Great thread! "It’s important that for the first game I try and leave stuff untouched the best I can so I can get a real feel of how stuff is working and what’s going on. I’ll still make the odd changes in game if I feel I’m losing the game. But for most parts I like to let the game play out without changes if possible so I can view it back after. Watching a game after its happened is easier than watching one that’s in play because sometimes you view it differently because the result doesn’t matter as the game is over." I think that generally people are now able to build a coherent tactic (often with help from this forum) once they really know how they want to play, but that's only the start of the battle. Your use of the analysis tab above shows how to refine things in pre-season, and I'm particularly keen to see the posts which show how you identify issues whilst a match is under way, as I reckon that's the area that causes most difficulty in Football Manager. The analysis tool is invaluable to me as I find it quite hard to see exactly what is happening in the 3d visualisation of the game. 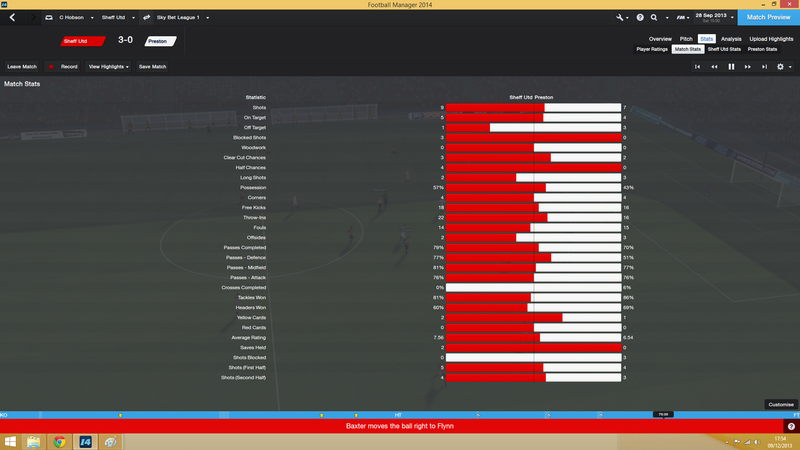 But the heat map for me is the main one I use (especially early on in a game). Using the oppositions heat map I can see exactly how the oppo is lining up and what they're plan is. Because it's an average it only really works earlyish. Build a solid base tactic to start with (again, the threads I mentioned above should really help out in this regard), stick with one philosophy for now. Repeat steps 3 and 4 until you need to build a whole new tactic. Simply referring to this thread will suffice from now on! The development of my tactics is a problem for me, so I am looking forward to that part. After winning championship in Portugal the next season became a real struggle with most of the opponents parking the bus. 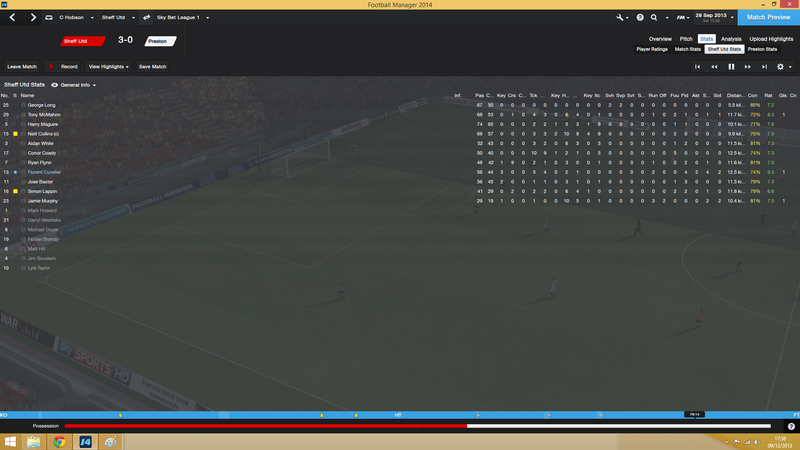 Had to let Porto (managed by a friend of mine) get back the top. The 12 step guide teaches you to walk. The Pairs&Combination series teach you to jog. And this, this teaches you to run. Love these threads. It shows you how to use the tools and improve your tactic and get the best out of your players. And as RTHerringbone, just when I was happy with FMC, I see all these tools and want to go back to a full version game. Brilliant. I'll bookmark this. 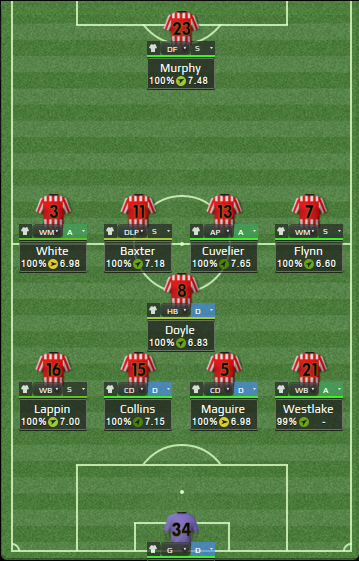 I'm in pre-season of my second season after winning promotion to Skrill Premier. The opposition is far tougher so I'll need these tips to tighten up. Great thread and very informative reading. 1. Why did you go with Much higher tempo and Much higher defensive line rather than the more moderate alternatives? 2. Also, why did you not choose Shorter passing despite BM using same? 1. Because I am hassling opponents so if I didn't push very high up I risk people being caught out of position due to me being aggressive and attacking. 2. I don't agree that BM play short passing at all. They are quite mixed and varied and if you read the links I posted in the opening post this confirms it. Thanks for the reply. Yes, I would agree that BM plays quite mixed passing, it was just that you wrote in the post (under team instructions) they played short passing so that threw me off. I have never really managed to get short passing to work, so thought maybe you decided against it. New entry in journal made, Cleon made a mistake. Are there any plans on getting this the sticky it deserves? In my opinion it works perfectly with the '12 step' and the 'pairs and combinations' guides. If these three threads would be seen as a whole starters-pack for anyone facing tactical problems, most of them would be easily solved. I think it would be a shame if this thread ever drops from the first page, as so many other great threads have before. On another note, would you be open to the idea of having this thread translated into another language? Thanks twice, will let you know whether it will happen. Cleon, how to cut off through balls when playing higher/much higher defensive line? I'm playing with 2 CDs (D), 2 WBAs (not in FBs positions) and 1 HB as Inter Milan. Our defenders aren't that fast against pacey strikers. I don't think it will be good to use Hassle Opponents and Drop Deeper/Much Deeper at the same time. I'm getting frustated of it. I'm sorry if my English isn't good. Depends how and where the through balls are coming from. Try and cut off the supply of the person who is doing them the most. Or play the offside trap, but that can be risky too at times. Use the analysis tab to see how they are happening. Post #4 is a good one, and has got me wondering - would you say you changed those CM Roles around because of the way that game was going at that point in time, or do you think it was the way your development of the tactic was heading anyway? It's a good question actually. I think what swayed it this time around was I was playing okay but just too deep and lacking any serious threat/support from the midfield. Considering I already play attacking and with an highline I didn't feel adding player instructions would have helped really because in hindsight the roles were the actual issue due to them being deep and more creative roles. I needed to get in behind them and the simplest way was a straight role swap. On another day though I might have done things differently and made a change to strategy or added player instructions. I think that its important you understand the manner in which things are happening. For example if you think you're playing well then you don't need to do a drastic change. But if you think you're playing poorly then that suggest the current set up isn't working and it might require something more drastic to get you involved in the game. I guess what I'm trying to say is it all depends on the context if that makes sense? BTW I only made that change during this game and haven't used it again since, so you could say it was for that game and that moment. One thing I always struggle with is... how do you understand the reason your player shot or passed? How do you decide whether he shot because he had no option or because he wanted to? In general, how do you spot exactly why something happened? Thanks in advance. Use the analysis tab and watch the clip back. Pause it and have a look around and rewind it if needs be, then look at how the players are positioned. 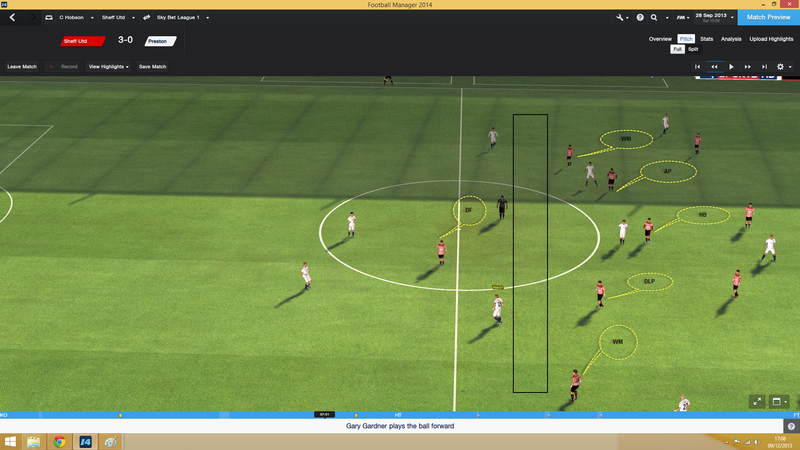 Look to see if the player has passing options and use different camera angles to view the same clip. Often you'll look and think along the lines of 'well he could pass to him its simple' yet look at it from a different view and you might see the players view on the ball was obscured so it might not have been as simple as you first thought. I will, thanks for the reply! Bear in mind that squad gelling has an impact on how players relate to each other. I've witnessed some great passing when my first team played a lot together, as if they already know who's running where exactly. They take a lot less pot shots and passing in general has improved greatly without changing much about my tactics. Your change in post #4 had a massive impact indeed! I'm glad you posted it, because I always wondered how you did actually play FM, since you do have a sound (talking of understatements) tactical knowledge, but sometimes you refer to the fact you don't change a lot when your tactic is ultimately set. It all comes down to logic, about the same logic I find useful when I make changes during the game, with some exceptions of course. If I may offer some criticism for the sake of making things more clear, could you offer a screenshot of the change? That way it's easier to visualize the change you made. I know most people reading this have no problem doing so, but personally, I need strong visual feedback in order to understand things properly. That's due to a lack of short term memory, which causes me some problems reading in fora as a whole, especially if the language isn't my native tongue. Thanks again for putting all this work in making things clear, I'm certain the community as a whole profits from the insights you give us all. I'm certain the GD would be overloaded even more by moaning about how broken the ME is, if it weren't for threads like this. We play the same formation, but for very different reasons. I'm playing a defensive 4-1-4-1 with defensive/counter/control mentalities and naturally my player instructions differ because I'm not playing attacking and don't have the skilled players to make it work with short passing. I also use FBs rather than WBs because of the better defensive cover, a CMa and DLFs but in principal I don't think we'd differ too much in styles. Unfortunately FM has kicked out my YouTube login details and now won't let me store them as I also had a cracking start I'd like to share. Look forward to reading more updates. This is a major point for me; my biggest gripe however is the impact of Tactical Familiarity. The slightest alteration to philosophy, strategy, personnel or anything else sends TF crashing. As a result I find my efforts to observe and analyse hindered. So I want to ask Cleon, when you try out a new idea, how do you tell when supposed errors are due to your tweaks and which are due to lack of TF? In my save, I'm in 2nd pre-season. 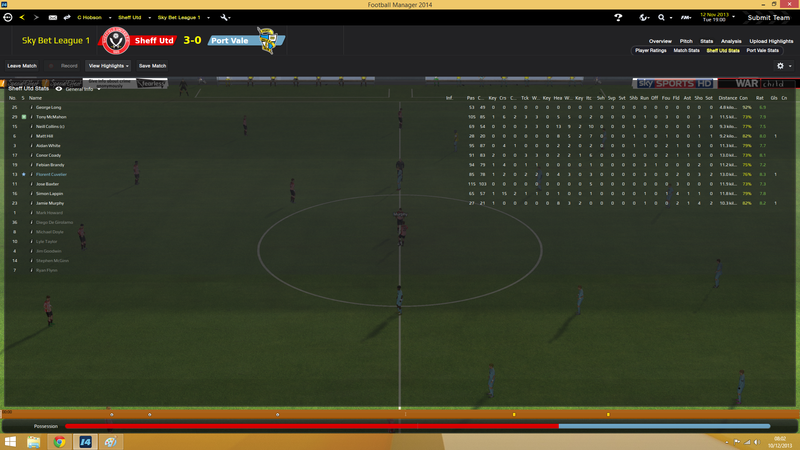 It took me until February of my first season to attain fluidity with my one tactic. I'm stuck on 4-1-3-2 Counter/Rigid. I want to use pre-season to expand to Control/Rigid, Balanced and Fluid philosophies and a back-up alternative formation. 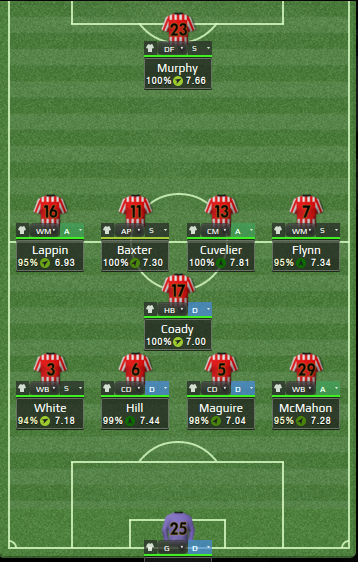 Even with no new first team squad purchases and 11 friendlies to play around with, I doubt I'll achieve more than one of my goals, probably adding Control/Rigid to Counter/Rigid in my one formation. Interesting, I do something similar at times. However in the scenario I posted how would changing the player have worked and not the role? The issue was getting someone more forward and using the space higher up, I can't see how a change of personnel would have worked without changing the role. The players playing are already attack minded with attacking PPM's but were being pushed back by Preston due to my players marking them. The only logical solution in this case was to give the players different space to play into to stop them being dragged so deep. Regardless of who played I'd have still had the same issue. How do you mean a screenshot? Just of the new roles I added? Well I'm normally almost all full in tactic familiarity when the season starts. But I guess I can kind of tell because I keep changes minimal until its al fluid anyways. When watching a game you kind of pick up if you are playing okay but its not clicked yet and 9/10 I put this down to lack of TF. Interesting, I do something similar at times. However in the scenario I posted how would changing the player have worked and not the role? The issue was getting someone more forward and using the space higher up, I can't see how a change of personnel would have worked without changing the role. Wouldn't a player with "gets forward whenever possible" PPM play the role of AP(A) or DLP(S) differently than a player without that same PPM? If a player is picking up a man and marking them then this can cause them to become deep and not in a position to start attack because they get dragged so deep, so regardless of PPM's if he's sticking to his marker and being forced back then he isn't being effective in the areas you need him to be. Against a flat 5 your own two MC's always have 2 out of 3 players to mark at all times which when using a DLP isn't always the best because they don't get that free space they need to dictate the game and get involved. I have a couple thoughts. The first is related to this. Did changing the CM's role change the way he marked the opposition, or was the change effective because he became more of a runner, and left his marker sooner to start his forward runs? Kinda jumbled, so I hope that makes sense. On an unrelated note, I thought the instruction to hassle opponents maxed out both the D-line and closing down, so the instruction to have a much higher d-line would be superfluous? It meant the CM was more advanced positionally than the DLP because the DLP tend to hang and drop back where as the CM is more forward thinking and does runs forward into midfield. Cleon's always been the one to add the meat to my bare bones. What the thread does is illustrate how the structure (which, of course, he's nailed) is merely a starting point and that users need to develop a logical system of play around that. Lots of people could learn lots of things from this thread. That's right, I had forgotten you had changed the DLP to the AP. In my head it was a straight change from AP to CM attack. Makes more sense why that worked now. Sorry I missed the last bit of your question. Hassle opponents has nothing to do with defensive line and is still the same as in FM13 I believe which is closing down and tight marking. yep, it would visualize the changes you made. That's what I was basing my question off of, from the New Tactical Elements thread from a couple months ago. The post immediately following that quote amends it to include much higher/lower shouts too. What! wwfan wrong? Not possible!